The perspective on Thai history has been changed by archaeological excavations in the north-east of the country. Discoveries involving bronze metallurgy seems to suggest, controversially, that the Thais may have originated in Thailand following the initial arrival of Homo sapiens in south-east Asia and later scattered to various parts of Asia, including China. No definite conclusion has been reached, and many more theories have been put forward with some suggesting that Thais were originally of Austronesian rather than Mongoloid origin. A Hindu and Buddhist Dvaravati culture predominates in territory that will later form parts of Siam. This culture is thought to consist of the ethnic Mon people. Until recently, the accepted theory was that the Thai / T'ai people originated in north-western China, and migrated south to Thailand in around 600 BC. Once there, they split into two main groups; one settled in the north and founded the kingdom of Lan Na, the other settled further south to found the kingdom of Sukhothai. A modern theory suggests that the migration took place in the opposite direction, from Thailand to China and elsewhere. An inwards Hindu migration followed in 300 BC which gave the country a diverse ethnic and cultural background. The Sukhothai kingdom is founded in the south of Thailand. The Lan Na kingdom is founded in the north of Thailand. Founded by King U-Thong in 1350, he expanded Ayutthaya's territory, especially northwards towards Sukhothai and eastwards towards the Khmer capital of Angkor. The government was an autocracy, and there were, roughly, three classes of people; the king at the top of the scale, along with the king's family and ministries, then commoners, and slaves at the bottom. The first Europeans to visit the country visited Ayutthaya, which was responsible for one of Thailand's most glorious eras. The capital was roughly 55 kilometres north of Bangkok. Sukhothai is conquered by Ayuddhya. Ruled in Phitsanulok only (1463-1488). A Portuguese embassy is established soon after the arrival of these first Europeans. Ayutthya, and Lan Na's capital at Chiang Mai are taken under the control of the Burmese. The Thais are able to regain both states' capitals, Ayutthya's being regained by 1584. A new Royal Seal is obtained from China. Fought the Khmer. Defeated the Burmese. The Burmese are defeated at the battle of Nong Sarai. The Burmese invade the city of Ayutthaya again and, this time, they succeed in taking it. However, after two years the Burmese find they cannot hold onto the kingdom in the face of attacks by Phaya Taksin and withdraw, leaving Siam in a power vacuum. General Phaya Taksin flees to Krung Thonburi and promotes himself king. Phaya Taksin was a Thai general from the Ayuddhya Kingdom who fled to Krung Thonburi and promoted himself king, taking advantage of the power vacuum which existed after the Burmese had been driven out of the region. Former general who filled a power vacuum. Krung Thonburi conquers Lan Na. Taksin is executed by his ministry, allegedly because he is psychotic. Rule of the country passes to the Chakris. The Rattanakosin kingdom saw the accession of a dynasty that remains on the throne in modern Thailand. The country has, since 1932, been governed as a constitutional monarchy (albeit with spells under military junta), with its capital at Bangkok (founded by the Chakris), and a population (in 2015) of over sixty-eight million. The kingdom occupies much of the Indochinese peninsula, and is bordered by Laos to the north and much of the east, with Cambodia taking up the lower eastern border, and then by Malaysia to the south, while the long western border is filled by the Andaman Sea and Burma. The Chakris were inaugurated on 6 April 1782, following the execution of General Phaya Taksin who ruled the country after a Burmese invasion ended the previous ruling dynasty. The official name of the monarch is always 'rama', with each monarch's personal name being shown after this. During the great colonial age of the eighteenth to early twentieth centuries, Siam (as it was known) was the only country in South-East Asia to escape occupation and foreign rule. Instead its monarchy, Buddhist religion, and the military helped to shape a forward-thinking, progressive state that was able to negotiate its way around various attempts to initiate colonisation by European powers. Essentially, it became a western power that could demonstrate that it was equal to the representatives of the other western powers, thereby removing any pretext for an invasion or the establishment of a colonial protectorate. Also unlike most of its neighbours, Thailand retained its pre-colonial age institutions, especially the monarchy. Rama raises new laws to govern the country, and extends Siam's territory to encompass all of Laos, and parts of Burma, Cambodia, and the Kedah province in Malaysia. 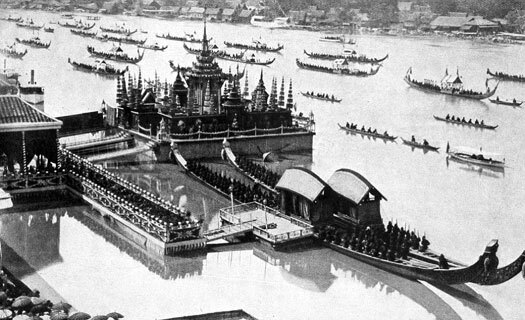 Rama also realises that the capital at Krung Thonburi is vulnerable to invasion, so has it moved across the River Chao Phaya to a small village known as Bangkok. Brother and 'Second King' (co-ruler and heir). Died. Son of Rama I and 'Second King' (co-ruler and heir). Royal 'rama' naming system established by his son. The reign of Phra Phutthaloetla Naphalai, who accedes as King Loetlanaphalai, is recognised as a glorious one for art and literature. He writes a new version of Ramayana, which becomes one of the most beautiful epics in history. Many pieces of valuable literature are written in this era. However, as soon as he succeeds his father, he faces rebellion by Prince Kshatranichit, the surviving son of Taksin of the preceding Krung Thonburi kingdom. The rebellion is very quickly crushed. Next is King Bodawpaya of Burma, who marches an army into Chumporn and conquers Thalang (Phuket) in the same year. Loetlanaphalai sends his brother, Maha Senanurak, to recapture Thalang, which had been razed to the ground. This 'Thalang Campaign' is the last invasion by the Burmese into Siamese territory. Son of Phaya Taksin of Krung Thonburi. Pretender. Son. Re-established vital trade relations with China. Uncle and 'Second King' (co-ruler and heir). Died. The First Anglo-Burmese war ends in 1826 with the Treaty of Yandabo, according to which Burma cedes the Arakan coastal strip, between Chittagong and Cape Negrais, to the British East India Company. The British victory gives the subjugated King Anouvong of Laos ideas of independence from his other oppressor, Siam. He advances to Korat, the main border city between Laos and Siam, but the non-Laos citizens there rebel against him and the Siamese army under Sakdiphonlasep catches up with him at Vientiane. After three days of fighting Anouvong is defeated but remains free to recapture his own capital from Siamese troops. The Siamese have to defeat him again, and the captured monarch is placed in a cage for the remaining year of his life. The Laos Rebellion is at an end. Son of Rama II. 'First King'. Killed by malaria. Chulalongkorn continues his father's progressive policies with reforms of the state's tradition, legal, and administrative realms. As a starting point, officials are allowed to sit on chairs during royal audiences. Thailand also develops relations with European nations and the USA, and introduces schools, roads, railways, and Siam's first post office. He even establishes a civil service system. Siam loses some territory to the French, Laos, and British-controlled Burma. After that Chulalongkorn declares his country to be an independent kingdom on 23 of October, making the day a national holiday (this national holiday is subsequently celebrated every year in commemoration of this event, and people lay wreaths in memory of the king they call 'Phra Piya Maharaj', 'piya' meaning 'beloved', and 'maharaj' meaning 'great king'). The king overhauls the administration of Siam to a form of cabinet government with twelve ministers. Vajiravudh introduces westernisation to Siam, bringing in primary school education, and encouraging Thai women to grow their hair to a certain length. Surnames and football are also introduced. Having jointly guaranteed in 1839 to support the neutrality of Belgium, when the country is invaded by Germany, Britain and all its territories and colonies (including Canada), France and Russia are forced to declare war at midnight on 4 August 1914. The First World War (variously called World War I, or the Great War), begins, and in 1917 Thailand decides to become an official ally of Britain. The world's economy is still suffering badly from the Great Depression, and Siam is heavily affected. Prachadhipok has already replaced many of Vajiravudh's discredited civilian advisers with more experienced members of the royal family. Unfortunately they have not adequately communicated their policies to the general populace. Prachadhipok has been blocked from changing Siam's form of government from absolute monarchy to democracy, so elements of the military take the decision out of his hands in a bloodless coup. The reforms are forced through, developing the new constitutional monarchy along British lines, with mixed military and civilian power-holders and a parliamentary government. Commander-in-chief of the armed forces, Phraya Phahonphonphayuhasena, and his immediate successor, Lord Phibul Songkhram, are both key players in the coup - two of the so-called 'Four Musketeers'. The latter maintains his own position and power from 1938 until the end of the Second World War. Several other military leaders follow, and all of these are shown below with a shaded background. Commander-in-chief of the military and the true power. Nephew of Rama VII. Assassinated in mysterious circumstances. Military leader and the true power. Almost simultaneous with the Japanese attack on Pearl Harbour, their forces land in Siam's territory. Initial Siamese resistance is brief, and following negotiations, the Japanese forces are allowed to advance towards the British-controlled Malay peninsula, Singapore, and Burma. Now under some pressure and persuasion from Japan, in 1942 the military government declares war on Britain and the US, although the Thai ambassador in Washington refuses to deliver the declaration to the US government. Having been moved by his parents to Lausanne in Switzerland in 1933 for protection during the post-coup period, King Ananda is away again when the Japanese arrive. He is unable to return until 1945. Brother of Rama VIII. World's longest-serving monarch. The country's name is officially changed from Siam to Thailand, which is defined in the Thai language as 'Prathet Thai'. 'Prathet' means 'country' and 'Thai' means 'freedom', declaring Thailand to be the 'Free Country'. Unfortunately in the post-Second World War period, the country has many spells during which it is not as free as it should be. The military rules for much of the time, with a few interludes in which the country enjoys a democratically-elected government. The first of these coups takes place in 1947. The military retains power continuously until 1973, despite attempted counter-coups by elements that are linked to the monarchy and by rival military elements. Military leader who returned to power. Exiled. The coup d'état of 1957 - seemingly with US involvement - leads directly to a second coup in 1958, this time by Field Marshal Sarit Dhanaraj. He is supported by a good number of royalists who want to tilt the balance of power back in their favour. 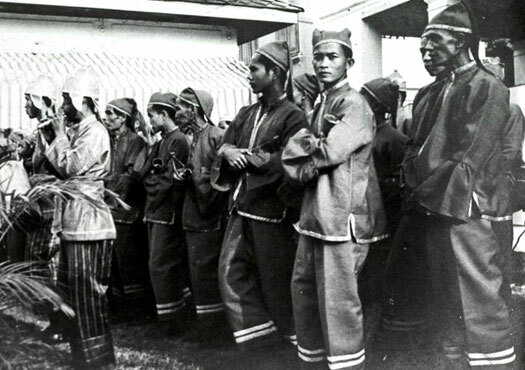 Phibul Songkhram is forced into exile in Japan, where he remains until his death in 1964. Field marshal and the true power. Died in office. Field marshal and the true power. Stepped down. Thanom Kittikachorn's constant self-promotion (literally, as he continually appoints himself to ever more senior military ranks and positions) has finally generated enough public discontent to make a difference. The '14 October 1973 Uprising' involves student-led demonstrations for a re-establishment of democratic government. Three days of violence later, Thanom Kittikachorn's regime collapses and he flees the country. Thanom returns to Thailand on in October, now in the guise of a novitiate monk. His return triggers student protests which quickly increase. Given the highly unstable political situation in the region, especially in Cambodia, Laos and Vietnam, right wing Thais see the protests as a move to initiate another communist takeover. A massacre of protesters takes place on the Thammasat University campus, enacted principally by right wing activists but backed by the government. The military seizes power later that same day under the leadership of Admiral Sangad Chaloryu, removing the elected civilian government from power. However, it is the king who appoints the new prime minister, and the military are limited to secondary posts. Civilian prime minister, unelected and dictatorial. An attempted coup is foiled without being able to achieve its aim of removing Tanin Kraivixien, who has proved himself to be a dictator in all but name. Admiral Sangad Chaloryu steps in and ensures the prime minister's removal himself. As the head of the National Administrative Reform Council (NARC) - the military junta that takes control - he briefly rules before being replaced by the true power behind NARC, Kriangsak Chamanan. Military leader and the power behind NARC (the junta). Retired. Prem Tinsulanonda dissolves parliament following political unrest. He calls for a general election and refuses requests to return to his role as premier. 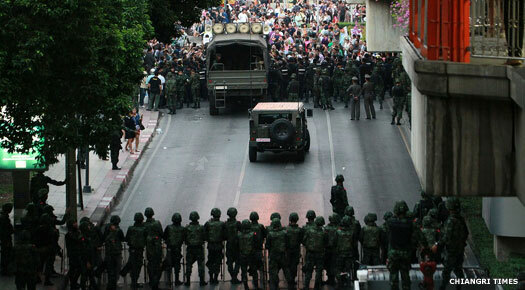 Instead the winning Chart Thai Party now governs the country. Thai politics becomes dominated by the irreconcilable split between the supporters and detractors of Thaksin Shinawatra, who serves as the new prime minister until he is ousted by the military in 2006. Thaksin's sister, Yingluck, becomes prime minister following the 2011 election but in turn is ousted by a military coup in 2014. The government and military control nearly all of the national terrestrial television networks and operate many of Thailand's radio networks. The media are free to criticise government policies, and cover instances of corruption and human rights abuses, but journalists tend to exercise self-censorship regarding the military, the monarchy, the judiciary, and other sensitive issues. The death of eighty-eight year-old King Rama IX on Thursday 13 October prompts a national outpouring of grief for the beloved monarch. Two days later the crown prince, Maha Vajiralongkorn, announces a personal period of mourning of a year, with his coronation delayed until then. The country, too, enters a period of mourning that will last a year, with entertainment events and tv toned down or cancelled altogether. Former Prime Minister Prem Tinsulanonda stands in as regent for the duration. Son and heir of Rama IX. Born 28.06.1952. The fact that Maha Vajiralongkorn has been married four times and divorced three times, and has eight children, makes the succession rather more complicated than it normally would be. His sons by his second wife have been stripped of their royal status following their father's divorce and their mother leaving Thailand to live first in the UK and then the USA. The daughter from that relationship was soon kidnapped by Vajiralongkorn and brought back to Thailand where she has been confirmed as Princess Sirivannavari Nariratana. The king has married twice since that relationship, first to Srirasmi Suwadee (divorced 2014), and then to Nui, more formally known as Suthida Vajiralongkorn. The first of those unions produced Dipangkorn Rasmijoti, the current heir presumptive, while the second produced a boy (around 2014-2015) who would seem to be second in line to the throne.